The world’s earliest known musuem was set up in 530 BC in the dying years of one of the oldest known cities of the world, Ur in Babylon (now Iraq) by a woman, Princess Ennigaldi, the daughter of the last King before the citysuffered terminal decline. The first excavations of the city, in 1853-4, were financed by the British Museum, but it was during the major excavations in 1922 to 1934, funded by the British Museum with the University of Pennsylvania, that archaeologist Leonard Woolley, later knighted for his work there, came across the evidence of the world’s first museum, a labelled collection of local antiquities from various ages, including some from the foundation of Ur some 2000 years before its demise. Objects from Woolley’s excavations are now a part of the collections of both the British Museum and the University of Pennsylvania, and the Iraqi authorities hope to develop the ancient city with its ruins as a tourist attraction. 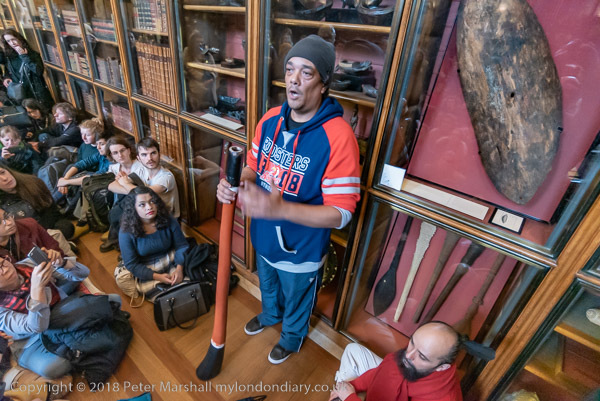 As a part of this there will doubtless be some kind of museum in which various objects can be displayed, probably including replicas of some at least of those objects in London and Pennsylvania. It would be a shame to see this collection broken up, but it seems to me that there are some items in it that should be returned – and perhaps replaced in the collection by carefully made replicas. 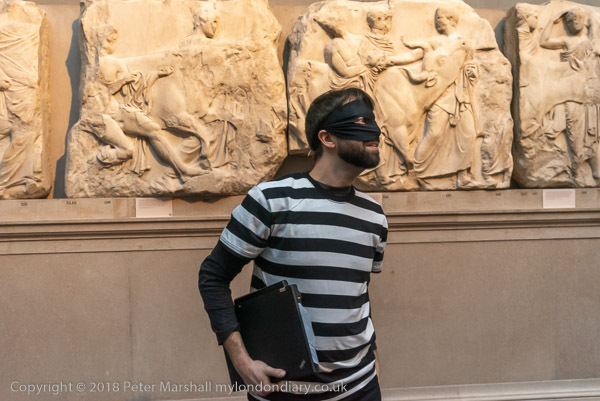 Probably the best-known of these are of course the Parthenon marbles. We used to call them the Elgin marbles, bought by Lord Elgin from the Turkish occupiers of Greece in a rather doubtful transaction. Certainly the Turks had no moral right to dispose of Greek heritage in this way. 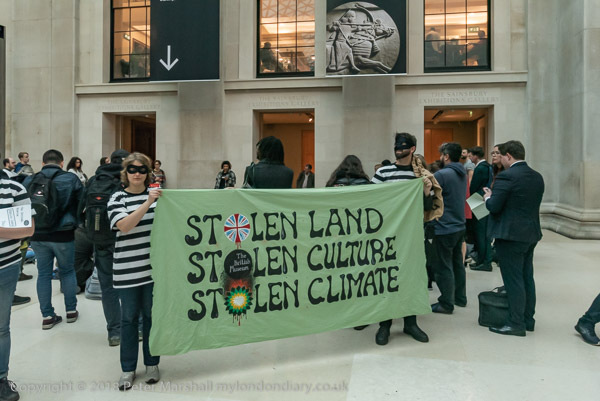 While those exhibits from Ur were from an ancient civilisation that was conquered and disappeared many years ago, there are other items which were taken by force or stolen from communities that still exist, and it was one of these that was at the centre of the British Museum Stolen Goods Tour organised by BP or not BP? 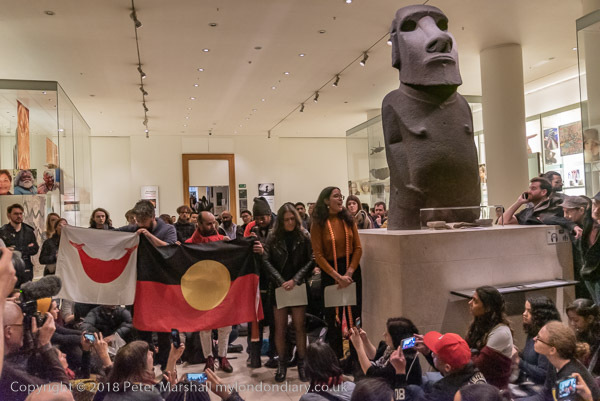 on December 8th, led by Indigenous Australian campaigner Rodney Kelly, a 6th generation direct descendant of Cooman, whose Gweagal shield was taken when Captain Cook’s men arriving in Australia fired on him. In a cabinet to his right, you can see the hole close to its centre thought to have been made in it by a musket round. The shield, along with other stolen objects still have great cultural significance for the Gweagul, and would both form the centre-piece of a new cultural museum and also a springboard for a renaissance of indigenous culture. A similar case can be made for the return of the stolen Moai Head from Easter Island, whose return is demanded by the Rapa Nui Pioneers. 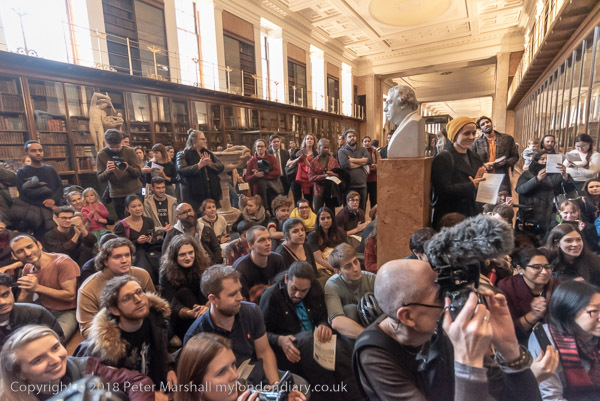 More about the protest against the British Museum and climate criminals BP at British Museum Stolen Goods Tour. This entry was posted on Monday, February 11th, 2019 at 08:58 am and is filed under My Own Work, Political Issues. You can follow any responses to this entry through the RSS 2.0 feed. You can leave a response, or trackback from your own site.